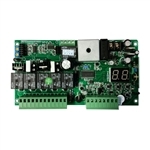 Purchase circuit boards from AlekoGates. These circuit boards are meant for swing and sliding gate openers. All our circuit boards are performance tested and give you optimum performance every time. We also have AC control boxes with PCB for you.